Baba had remarked on the morning of the 31st that he would be free of suffering after seven days. Taking this as a meaningful hint from him, the trustees held a meeting and the interment was fixed for Friday, 7 February 1969, at 12:15 P.M. The 7th that year also happened to be Baba’s birthday according to the Zoroastrian calendar. The women garlanded Baba, the doors of the Tomb were opened and they departed. The final darshan began. Only a very few were allowed to descend into the crypt and touch Baba’s feet. There simply was not enough time for everyone to have that privilege. 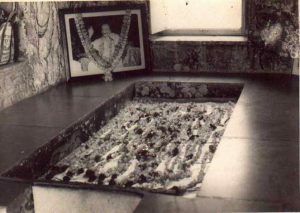 After 7:00 A.M., no one was allowed to enter the Tomb except the two men on duty, one at the door and the one fanning Baba. Many were given the privilege of this duty for two minutes each. After sunrise there was a tremendous rush of people to Meherabad, as newspapers in Poona, Ahmednagar and other areas publicized that 7 February would be the final day of darshan and Baba’s body would be interred at 12:15 P.M., exactly seven days after he dropped his body. By 11:20 A.M. everyone present had taken their last darshan of Baba’s body. Aneece Hassen took some film footage inside the Tomb. Exactly at 12:00 noon, Kenmore said the Master’s Prayer, and at 12:15 P.M. again three loud cheers of “Avatar Meher Baba ki jai!” rang out. The doors of the Tomb were closed temporarily, while Baba was covered with a clean sheet. Eruch removed the ice blocks, passing them to the other mandali who stood around the crypt. These were passed to the Westerners who stood outside. When all the blocks were removed, the pink cloth around Baba’s head was changed for the last time. His hair was brushed, the scarf around his head straightened, dust particles on his face gently wiped away, and he was adorned with fresh roses. Mehera, Mani and the other women mandali then came to the Tomb to have their last darshan. Soon, Baba’s dear physical form would no longer be visible. All stood silently around the Tomb. A quiet peace reigned. In the pin-drop silence, only the heartbreaking sobs of the one who loved the Only One as he should be loved could be heard. Mehera and the other women fell at Baba’s feet. Tears containing the memories of years in his company poured from their eyes. After Mehera garlanded and kissed Baba in final farewell, the women stepped out of the Tomb. The men mandali then went inside the Tomb. The wooden coffin lid was passed through the door of the Tomb by lovers standing outside. The lid was brought inside and ropes tied to the four handles on its corners. Just before it was placed over Baba, Eruch went down in the crypt and placed a very fine scarf given by Mehera over Baba’s face. The coffin lid was hoisted up by the mandali standing on the crypt’s landing. Amidst loud cries of “Avatar Meher Baba ki jai!” the lid was slowly lowered over Baba — sealing him from sight for all time. Mehera and the other women watched from the north window. After the coffin lid was in place, the men mandali came out and the women went inside once again to lay a large garland of roses over the coffin. After Mehera and the others left, the men went in to strew flowers over the entire coffin. A ghamela (iron pan) full of earth was brought inside, and each of the men mandali scattered a handful of earth over the coffin. leading to it and the steps were covered with earth. About half a dozen six-inch-wide wooden boards were placed horizontally across the top of the coffin for added support and protection to the cover over Baba’s body. Because it was Baba’s birthday (according to the Zoroastrian calendar), prasad was distributed to all who came for darshan. After nearly five hours, by 5:00 P.M., the crypt was filled with earth. The floor of the Tomb was swept and cleaned. Baba’s seven-colored flag was draped over the earth. The women mandali returned to the shrine again to offer flowers to their Beloved who is never born and who never dies, who is eternal and immortal and besides whom there is none. After coming in physical form to make God’s infinite love and compassion tangible to us, he became imperceptible so that we may seek his Impersonal form which is real. To die for the Beloved is not easy; it is the most difficult thing. Only such a death − one that merges the rounds of births and deaths within it − makes one realize that Meher Baba neither comes nor goes, but exists always.